In 1972, Smith composed Here and There, IIa. Smith originally conceived the piece for performance using short wave radios to connect the musicians separated by distance, but the work was never performed. Now, nearly 40 years in waiting it will be realized by the IUPUI Telematic Collective and Syneme Telearts Ensemble. Since the purpose of the piece was to connect players spread across large distances, it has the same characteristics as works performed across the Internet. Of the use of the Internet, Smith says: “I never knew this would be possible when I wrote the piece, but this is the purpose I had in mind.” The work is a semester-length project of Joshua Fielder, who will be graduating in the summer with a Master’s of Science in Music Technology (MSMT) from IUPUI. The concert will also feature student musicians from IUPUI performing original compositions set to Virtual Reality environments created by students in the Hybrid Arts Lab at Indiana University Bloomington, under the direction of Professor Margaret Dolinsky. As an added feature, audience members will be encouraged to tour the Virtual Reality Theater (VRT), also in the IT Building, in order to see the performance from a different perspective. The VRT will also be open for approximately one hour after the concert for viewing of 15 newly created environments, and to watch as the student artists navigate through them. 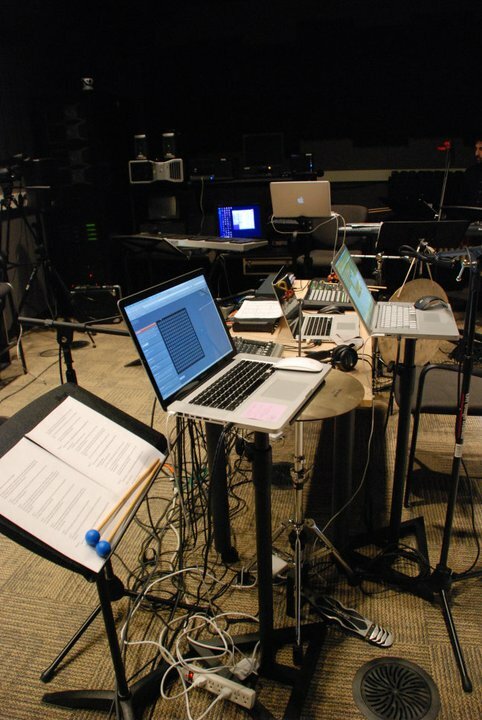 The RAT Ensemble will be performing with the TC using an interactive cloud system named NOMADS, that enables users to perform with their laptops over the web in tandem with the music onstage. Audience members are encouraged to bring their laptop computers to the concert, where they will be able to join in the performance of the work titled Nomadica. The Syneme Labs Telearts Ensemble will be performing online works that utilize spoken word, video mixing, and a sensor glove manipulating music parameters in real-time. You are currently reading Telematic Collective to Feature Stuart Sanders Smith World Premiere, Virtual Reality Environments, and more… at Telematic Collective.